Featuring a sleek and stylish design, our Zippo® personalised lighter makes a unique and useful photo gift. You can design your own lighter and create a wonderful keepsake for a plethora of special occasions. 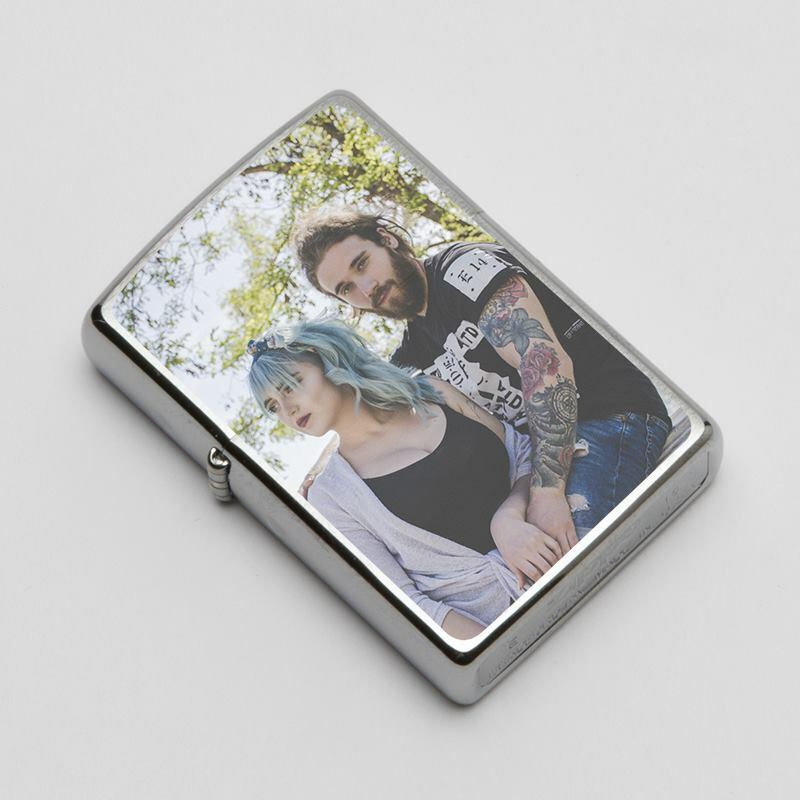 Your new personalised lighter is a genuine Zippo® product; it is wind-proof and features a smart, silver finish, which is perfect for showcasing your photos. Your design will feature on one side of the custom printed lighter and comes with its own gift box. Dimesions: 2.25" x 1.5" x 0.5"
Our personalised photo lighter is an official Zippo® lighter with curved corners. Refillable, reliable and recommended, Zippo® personalised lighters are provided in a gift box. These genuine Zippo® lighters have an all metal construction of exceptional quality and look beautiful. The elegant brushed metal finish is perfect for making prints pop, while giving the custom lighter a chic look and feel. Our custom printed lighters from Zippo® are wind-proof and feature a strong, hinged lid with the well-known, distinctive Zippo® 'click', so using them when you are out and about is not a problem. These customised lighters come with a wick and a flint already included. Your personalised lighters will also come presented in a smart gift box. Care: For advice on how to fill your lighter and replace the flint, please visit our FAQ page. Please be careful with naked flames. Close lid to extinguish. Not for minors. Your Zippo® is supplied empty for safety reasons. Clean with a dry cloth only. How Do You Print Onto My Customised Lighter? We flat print your design onto the front of the Zippo® lighter, including the body and the lid. We print on one side with a slight bit of tapering around the curved corners. Our printing techniques and methods promise flawless results, which we believe in so much that our customised lighters come with a 2 year guarantee. What Is The Print Like On The Photo Lighter? We flat print onto the front side, so it is very easy to make your own lighter. We use a specialised print transfer method, to print your designs directly onto the front of your lighter. This means that your print is fade-resistant as it is infused into the brushed surface of the photo lighter. As the print surface area is relatively small, we recommend using a single photo, logo or image, to guarantee a high quality and highly detailed finish. If you are giving this Zippo® lighter as a gift, a singular, special photo with the persons name would look gorgeous, or perhaps even a special message or in-joke would be fun. If you are a brand, then why not create a design based around your logo, to catch someone influential's eye and make an impact with brand visibility? When creating your design, remember that there is an opening for the lid of the lighter, so it can be flipped up. Although this will not impact the look of your print, it is worth keeping an eye on your final design to make sure you are happy with where the opening line is. Please note: Any white spaces on your design will be unprinted, these will appear as silver on the completed product. Our Personalised Lighter is a truly versatile product, which is as useful as it is stylish. It is perfect for men and women and is also great to keep around the house, whenever you might need a light. If you are getting hitched and needing ideas for best man gifts or groomsmen gifts then printed lighters are a fun option, especially as you can customise each one. From weddings and birthdays, to Christmas presents and anniversary gifts, our high quality, personalised oil lighter is a must-have bespoke gift. Who thought one can print on lighters? You might have thought that there were only engraved lighters available. The problem with engraved lighters, is that you are limited with your design. With our custom printed lighter, you have the opportunity to make it much more personal. From family photos to unique artwork and even a loving message, when you design your own lighter, you can take customisation to the next level. Your personalised lighter benefits from the famous Zippo lifetime guarantee. You can replace the majority of the internal parts as they wear down (examples of these consumables are the flint, spring, wadding, and wick). The specialised surface printing can last a lifetime if it is cared for correctly. Avoid putting in your pocket alongside keys or other objects which could cause damage to the surface of your lighter. Do not drop, especially on outside floors. Avoid splashing lighter fluid onto the printed area. Your personalised lighter and the print are extremely durable and scratch resistant, but if undue force is applied or sharp or pointed objects are used then it is possible to scratch it. Celebrate the big 3-0 with a tipple from their very own personalised hip flask.